TODAY, with the Austin Seven an estab­lished fact, the wonderful little white, single-seater Austin lapping the "mountain" circuit at Brooklands to the tune of over 70 m.p.h. skilfully piloted by Driscoll, or devouring the railway straight at speeds of over 80 m.p.h., we are apt to forget that even the Seven was once unknown. Its amazing achievements may seem rather commonplace when they become a regular occurrence, and thus it is worth while to recall the first appearance of the Seven in the racing world and how it performed in com­parison with the present competition models. It is interesting to discover that as early as Easter, 1923, the Austin Seven figured amongst the race-winners. In what then must have seemed an absurdly tiny racing car, Capt. Arthur Waite headed the long list of subsequent Austin victories by winning his race at the Brooklands Easter Meeting of 1923. His average speed was 59 m.p.h. The performance created a considerable stir, and amongst the people who were more than temporarily impressed was E. C. Gordon-England, at the time walking with sticks as a result of a gliding accident. Shortly afterwards he com­menced his long and noteworthy run of successes by taking Class Records at nearly 80 m.p.h., including the coveted "hour" at 73 m.p.h. In the 1923 two hundred mile race England entered the little Austin, which was up against the 1,100 c.c. cars, as no 750 c.c. division was recog­nised at that time. The performance in that race was really magnificent, the Baby running through non-stop to second place in the class, averaging nearly 77 m.p.h. for the whole distance. For 1924 the Junior Car Club recognised the 750 c.c. 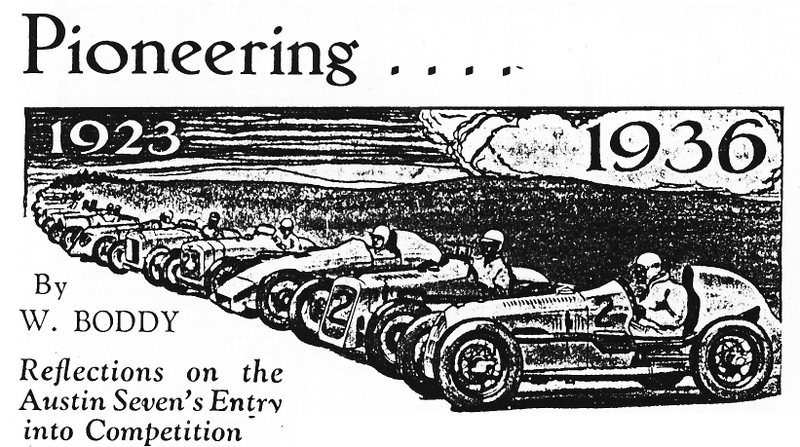 class in the two hundred mile race, and the general esteem of the Austin Seven a year after its entry into racing is revealed by the fact that no fewer than nine of these cars were entered. They had no rivals, and the winner again proved to be England, this time at 75.61 m.p.h. The lower speed is accounted for by the loss of one con-rod and piston towards the end, but even so, it surpassed that of every 1,100 c.c. car with the exception of the class-winning Salmson! Incidentally, England, himself no lightweight, carried a passenger throughout and, although his car was not specially streamlined, one lap was done at 80.33 m.p.h. the two hundred mile race, proving that the Austin was equally at home over the semi-road circuit as it had been previously round the outer circuit only. It was in this 1925 event that Capt. Waite ran a beautifully streamlined Seven, bored out to 776 c.c. to place it in the 1,100 c.c. section. To continue this history would fill many pages where we came to the stirring period when 100 m.p.h. first came within the possibilities of the baby car, achieved by Leon Cushman at Brook­lands during August, 1931 But the purpose of this article is merely to remind you of those very early days of baby car history when the Austin Seven entered, untried, into the stern field of competition, and did incredibly well right from the start. Few people expected a purely utility car - the world's smallest - to be much use in serious racing. Yet with the sole addition of two car­buretters and a special camshaft, the Baby Austin happily averaged over 76 m.p.h. for 200 miles on its first appearance in a classic contest. In conclusion, ignoring the classic contests altogether, it is instructive to note the best win­ning average speeds recorded year by year by Austin Seven cars, in the ordinary Brookland short handicap events that constitute the private owner's playground. The very first victory of all was gained at 59 m.p.h. in 1923. During 1924 Gordon England won a race at 75 m.p.h. The first Brooklands win at over 80 m.p.h. was registered in 1928 by G. Hendy, whose Austin won a 75 m.p.h. Short Handicap at 80.20 m.p.h. The 1929 President's Gold Plate event went the famous B.C. Austin Special "Mrs. Jo-Jo," at 80 m.p.h., and a "mountain" contest was won by Capt. Waite at 62.87 m.p.h. The speed of over 83 m.p.h. achieved by the winning Austin in the 1930 five hundred mile race, driven by S. C. H. Davis and the Earl of March was truly remarkable. The 1931 Relay Race went to the Austin Team at nearly 82 m.p.h. and, reverting to short handicap, A. B. Gilbert that year won a Club Sports Contest in a sports model at 85.57 m.p.h. lap speed. By 1932 lap speeds of over 90 m.p.h. were fairly common and in winning a race at the Easter Meeting Driscoll lapped at 102.48 m.p.h. And last season various Austin Sevens were lapping the difficult "mountain" circuit at from one to seven or eight m.p.h. faster than Gordon England and Capt. Waite was winning races straight away in 1923. Truly a great marque.